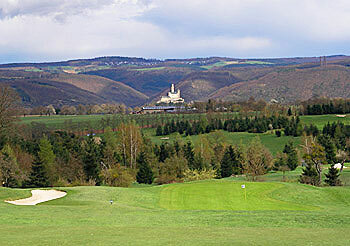 The history of the Jakobsberg golf course starts in 1157, when Frederick I Barbarossa founded a monastery on a plateau high above the majestic Rhine valley. After some trials and tribulations the remains of the estate were bought by Hans Riegel Jr. in 1960 and transformed into a hotel. The new owner was not a golfer, but the Gummy Bear king, heir of the founder of legendary German confectionery maker Haribo (an acronym for Hans Riegel, Bonn). He was also a big game hunter, when that was still de rigueur in Africa and elsewhere. At home he roamed the more modest hunting grounds adjacent to his hotel and entertained the rich and famous. When hunting went out of fashion, he needed a new plan for the hotel and decided to build a golf course. It opened in 1994 and has gone from strength to strength ever since. The views are certainly stunning, but the real star is the layout. There are no weak holes on the course, all are strategic, fun to play and memorable. No extreme features or gimmicks are needed, it's all about balance here. There are undulations, some rather awe-inspiring, but it is a very comfortable walk. The greens are substantially contoured, but never over the top. There are wide, long fairways and tricky, short ones. Every club in the bag will be tested. Despite being wonderfully grown-in, the general scenery is always wide open, perhaps most reminiscent of a Tuscan landscape with its scattered trees and gently rolling slopes. This creates an atmosphere of freedom, no doubt helped by the plateau location, so the golfer will mostly look down on the landscape and perhaps feel a little larger than life. However, not everything that looks wide also plays wide! Jakobsberg has been holding up quite well as a 3rd level Tour venue and host of several German PGA events. It should be a sporty challenge for the eager weekend warrior. Long-term interest is guaranteed, because it is structurally sound and does not rely on one-off effects. Up until October 15th, 2013, whenever a helicopter flew over the golf course and landed near the driving range, causing all golfers to pause and reflect momentarily, it could very well have been old Hans himself at the helm. The club sports a quote on its homepage that says something to the effect of "it's hard to describe the extraordinary, but easy to recognize it." That, in a nutshell, is Jakobsberg for me. An absolutely loveable course on a hilltop bordering the Unesco World Heritage site of the Rhine Gorge, not far from the famous Loreley rock. Getting there is half the experience: most likely you'll be coming in from the North and progress along the banks of the Rhine, only yards from the most German of all rivers. When you drive (with your car) directly towards a huge medieval castle, you know that the course cannot be far - because the first hole, Marksburg, is named after it and you drive (with your driver) directly towards it. The last part of the journey is up a short, but winding mountain road and for some reason I always feel elated when going up there, although it's been more than 25 times.